Home » How do you help unrelated, orphaned cougar kittens form a family unit? Imagine the terror of watching your mother die, then you being darted, tranquilized, captured, put in a holding cell and later transported by plane to a strange place. 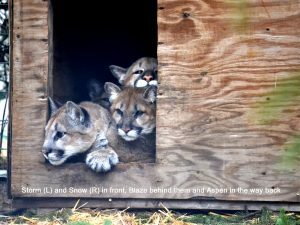 The trauma of what these four orphaned cougar kittens endured before arriving at The Wildcat Sanctuary would break anyone’s heart. 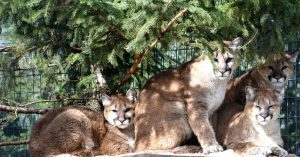 these four cougar kittens have now formed a strong familial bond at The Wildcat Sanctuary. And it’s something that doesn’t happen without planning. Cougars are solitary cats in the wild. It takes patient guidance from caretakers to encourage lifelong friendships like this to develop, especially for kittens who’ve survived so much already. The Sanctuary has already had great success with this in the past. Adult cougars Donoma, Andre, Noah, Langley, and Carlo all came from different states and Canada years ago as kittens. They’ve successfully grown up together, sharing their habitat with each other, for many years now. A few months ago, sister and brother Snow and Storm were first to arrive at the sanctuary . Aspen and Blaze, brothers captured elsewhere in Washington, arrived about six weeks later. They were all about the same age, less than six months old, when they arrived. You can watch trail cam video of Snow and Storm HERE. It was important to have them get used to each other as soon as possible – while they were still young – if a friendship was to form. Without their mothers for comfort, having others of their kind to grow up with would be important for their emotional development. In addition, merging cats together also creates an open habitat and space to help more cats in need. Caretakers spent the first few weeks getting these wild kittens used to having humans as their source of food. That’s a feat in and of itself! Naturally, having experienced so much trauma at the hands of humans, building trust is something that had to be done slowly. You can watch a video of Snow coming over to caretakers HERE. Volunteers at the sanctuary would sit for two hour shifts outside their habitats talking softly and reading to them, just so they got used to a non-threatening human presence. The next step was to have these two sets of cougar kittens in habitats next door to each other. Slowly over many weeks, they became used to the sight and scent of each other, with the safety of a shared wall between them. Then, an opening was provided between these two adjoining habitats so they could explore each other’s territory, yet have the safety of retreating to what was familiar, if they wanted. Caretakers sat and observed their interaction for many days to assure there were no territorial issues. Luckily, they all took to each other right away. Yes, there is definitely a pecking order and their personalities have been the same since arriving. Snow and Storm are much more comfortable around humans. Aspen is the most shy and stand-offish while his brother Blaze is the dominant cougar of all four. Caretakers continued to build their trust by cutting up their meals into small pieces and having the kittens come over for each piece, feeding them a piece at a time through the wire walls of their feeding areas. This helped them realize no harm would come to them and made it easier to train them for the next step. An intermediate size habitat was being prepared for them to move to that would have multiple perches, dens, trees, and toys for the next stage of development. Coaxing four suspicious wild cats into four individual transport carriers is no easy feat! But, the caretakers’ long months of working with them paid off and the move was accomplished without sedation, using positive reinforcement techniques. Now, these four are enjoying life together as a true family unit. Though they have multiple dens to cuddle up in, they choose to all be together so much of the time. 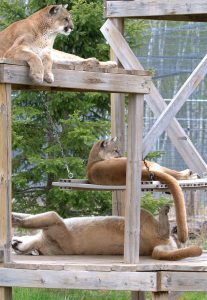 The sanctuary will be working on a larger habitat to move them to as they grow into confident adult cougars. Sign up for our enewsletter HERE so you can stay tuned for more details of their saga later in the summer!